Documents obtained through Freedom of Information Act requests filed by the Citizens Commission on Human Rights (CCHR*) in Massachusetts revealed that an incredible 64 percent of the children in the custody of the Massachusetts Department of Social Services (DSS) had been labeled with at least one "mental illness." Virtually all those so diagnosed are typically placed on one or more drugs with serious and even deadly side effects. Chris Garrison, director of CCHR Massachusetts, said, "These documents and reports from whistleblowers and parents of children taken away by Social Services make it evident that DSS and its mental health vendors are using children like Jessica as a commodity by billing for lethal drugs and needless, harmful psychiatric procedures." Not the least of psychiatric evils is the sanctioning of forced abduction and the drugging of children. Experts note that such labels as "Separation Anxiety Disorder," "Adjustment Disorder" or "Mood Disorder" could well describe normal responses to an abrupt, enforced removal from the child's home and family and into the clutches of a cold and abusive system. These tags are then employed to force children to take powerful drugs. At a hearing of the Human Services Committee of the Texas House of Representatives in October 2004, Ben Raimer, M.D., a pediatrician, testified that he had seen children in foster homes on "as many as 11 psychotropic meds." Raimer described visiting one foster home where four children, aged 2, 3, 5 and 6, were all on large numbers of drugs, with heavy doses of each. "The more the medications or diagnoses that a child is on, the more the reimbursement per child is for a foster parent," Raimer explained. The drugs pouring into the nation's foster children come at a high price. As Arizona State Representative Eddie Farnsworth told Freedom, "The heavy reliance on psychiatric drugs has had a very negative effect on the children in our society across the board." The omnipresent ADHD label, he said, has created an epidemic of child drugging across all facets of society. Psychologists and many people who are not medical doctors have labeled countless children with so-called mental disorders to promote the psychiatry-controlled CPS money machine. Neurologist Fred Baughman, M.D., told Freedom, "There have been amazing stories of diagnoses made in schools of ADHD, 'conduct disorder' and 'oppositional defiant disorder.' Then the schools turn to CPS to coerce the parents or take them to court to enforce the treatment of these things as though they were actual diseases, which they are not." The "treatment," he said, comes in the form of dangerous and sometimes fatal drugs. Children from the foster care system — dominated by psychiatry and its drugs — tend to do worse in life than those raised by their own parents or families, with study after study confirming that Child Protective Services (CPS) failed those it claimed to help. Statistics on educational performance, drug abuse, crime and homelessness reveal how the system has been crippled by psychiatric influences. A U.S. Senate measure from 2003, the Improving Education for Homeless and Foster Children with Disabilities Act, included alarming statistics: "In a number of states, more than 60 percent of children and youth in foster care drop out of school before graduation; a rate that is twice as high as the dropout rate for all students." A 2002 study by Child Trends, a research center in Washington, D.C., found that 48 percent of all former foster youths had graduated from high school,3 compared to 71 percent that year for all public school students.4 A 1996 University of Wisconsin study found that one-third of those exiting foster care became homeless,5 compared to less than one percent in the general population. "Money is a driving force" in the CPS system, author Mary Callahan told Freedom. More money is given by the state for ever more psychiatric diagnoses and ever-increasing amounts of psychiatric drugs. 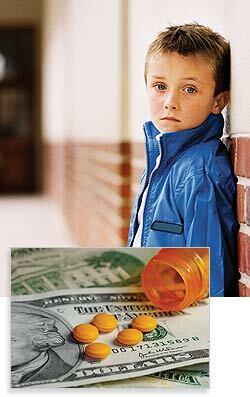 "If money only flows if kids get worse, somehow, they just keep getting worse," Callahan said. The heart of the matter, she noted, is to change the system so success, not further failure, is rewarded. A 2005 study* by the University of Chicago's Chapin Hall Center for Children found that 37.1 percent of those from foster care failed to get a high school diploma or general equivalency diploma, compared with only 9.4 percent of other Americans their age. This study, the most extensive of its kind in decades, also documented how those caught in the foster care system encounter higher rates of unemployment, homelessness, violence and crime. * Mark E. Courtney et al., "Midwest Evaluation of the Adult Functioning of Former Foster Youth: Outcomes at Age 19," May 2005. 1 Mark E. Courtney, Sherri Terao and Noel Bost, "Midwest Evaluation of the Adult Functioning of Former Foster Youth: Conditions of Youth Preparing to Leave State Care," Chapin Hall Center for Children at the University of Chicago, February 22, 2004. 2 Katherine Kortenkamp and Jennifer Ehrle, "Well-Being of Children Involved with the Child Welfare System: A National Overview," The Urban Institute, January 15, 2002. 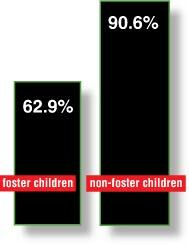 3 Richard Wertheimer, Ph.D., "Youth Who 'Age Out' of Foster Care: Troubled Lives, Troubling Prospects," Child Trends, December 2002. 4 Jay P. Greene, Ph.D., and Marcus A. Winters, "Education Working Paper: Public High School Graduation and College-Readiness Rates: 1991-2002," Manhattan Institute for Policy Research, February 2005. 5 Joshunda Sanders, "Little Preparation for Life After Foster Care," San Francisco Chronicle, August 3, 2003.